The Los Angeles Rams are headed to Super Bowl LIII to battle the New England Patriots. NEW ORLEANS—The Los Angeles Rams defeated the favored New Orleans Saints in a thrilling NFC Championship, 26-23. Rams kicker Greg Zuerlein nailed a 57-yard field goal in OT, silencing the raucous Saints fans from the Superdome on Sunday, January 20. The Rams overcame an early 13-0 hole, rallying to reach their fourth Super Bowl in franchise history. The pendulum swung in the Rams direction courtesy of a fake punt which gave the Rams new life. Rams QB Jared Goff was magnificent, outdueling legendary Saints QB Drew Brees. Tight-end Tyler Higbee’s 1-yard touchdown reception from Goff pulled the Rams within three points of the Saints at 20-17. Goff becomes the youngest QB to win the NFC Championship in NFL history. “We were just trying to score, get into field goal range . . . C.J. [Anderson] was running the ball well and I expect Todd [Gurley] to have a [heck] of a game in the Super Bowl. I can’t believe I’m even saying that. Unbelievable,” said Goff. The Rams will now vie for their second Vince Lombardi Title, their first SB victory in the City of Angels. The Patriots on the other hand will be playing in their NFL record 11th Super Bowl. The wonderful matchup is eerily similar to the last time these two teams met for the Vince Lombardi Title. Except the roles are reversed this time around. Back than, it was the juggernaut St. Louis Rams, led by Quarterback Kurt Warner who met the upstart Patriots in Super Bowl XXXVI. A second year QB named Tom Brady, stepped in after starter Drew Bledsoe got injured early in the year, shocking the ‘Greatest Show On Turf’ 16-13. It was the beginning of the Belichick-Brady era, an era which feels longer than the Ming dynasty and Roman Empire combined, winning five Super Bowl titles over the time span. It marks Brady and Belichicks ninth appearance. The Rams defense pressured Brees the entire game, forcing New Orleans to settle for field goals that cost them the NFC Crown. Trailing 23-20 with 1:45 remaining in the game, the Rams marched down the field. Setting up a Zuerlein 48-yard field goal to send the game into overtime. Every classic game needs a little controversy, right? Late in the fourth quarter, Brees’ pass to Tommylee Lewis was broken up by Nickell Robey-Coleman, who clearly ran into him. However, the referees neglected to throw a flag for pass interference, or helmet to helmet contact. It was a GREAT no call! Refs should never decide the outcome of playoff games. Human error is a part of sports! It’s what makes it so incredibly gorgeous and grotesque-depending on who one is rooting for. The Rams secondary, especially Cornerback Marcus Peters, talked loads of trash leading up to the classic NFC Championship. Insulting Saints head coach Sean Payton, telling reporters he is gonna be eating gumbo afterwards. Well, the Rams proved it. Drew Brees fluttered up a pass that was picked off by John Johnson III, who was able to hang on to the interception while falling onto his back. The acrobatic interception proved to be the play of the game. Los Angeles completed the comeback to hand New Orleans its first home playoff loss in since Sean Payton took over as head coach and Drew Brees took over as quarterback. This will be the Rams’ first Super Bowl appearance since XXXVI. Though the Rams had 4th-and-goal from the one-yard line, McVay elected to kick a field goal to tie the game at 20 with 5:03 left in the contest. It was a brilliant decision by the 32 year-old coach. The man is a genius! 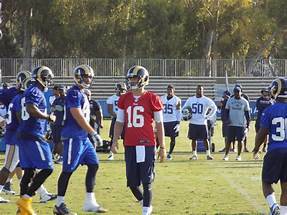 The Rams in three short years since relocating to Los Angeles have revitalized the city. The Rams will face the New England Patriots in Super Bowl LII (53). Angelinos were ambivalent and cautious after a generation without an NFL franchise. Move over Lakers, the city now belongs to the Rams February 3, from the Mercedes Benz stadium in Atlanta, Georgia. The game will air on CBS. Next articleHow Students Can Visit Most Expensive Countries?